The best CSGO training to practice aim and achieve higher rank in no time. All you need is a desire to learn - we'll teach you how to train. For free or almost free. Start CS:GO training schedule at no cost to easily improve or get premium program to go semi-pro. Basic 50-days aim training course for all beginners available for free! An advanced training program that creates the real aim machines! Our workout is focused on the aim practice, but it improves many more aspects of CS:GO. Here are just a few things that you'll learn with us. Training aimed at improving your CS:GO aim. To shoot headshots more often than usual. Training created for amazing flicks. To practice wrist muscle memory. Training for prefiring invented by Yprac. To surprise your opponent and be the first to shoot. Training created for more effective bursts. To hit even well-prepared enemies. Training designed to practice one-taps. To get phenomenal kills. A simple warm-up to prepare your hand, mind and skills before the main training. Training built for recoil understanding. To control spray in many ways. Training made to improve your in-game reflex. To aim faster and more precisely. The final and practical part summarizing training in the real scenario. You'll find below a training schedule which will make you a much better player, regardless of the level that you currently represent. Before starting with our free 50-days training, download 3 maps from the Steam Workshop. Afterwards go to GameTracker.com to find CS:GO servers in your area for deathmatch training. Keep in mind that it's not required to start at Day 1. If you feel that setup A1 (aim training - level 1) is too easy, you can skip to Day 4 with setup A2. If it's still too easy, go ahead to Day 9, ... etc. See all setups for burst and aim training. 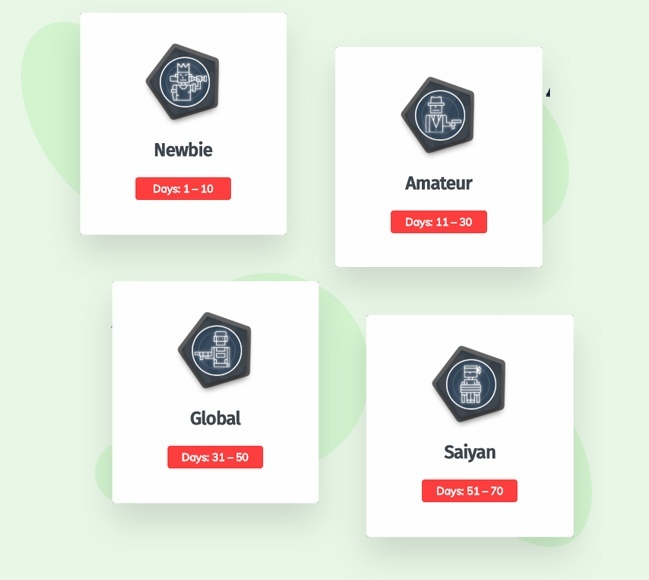 Choose your first day and start training! Read extra information about our free training course. 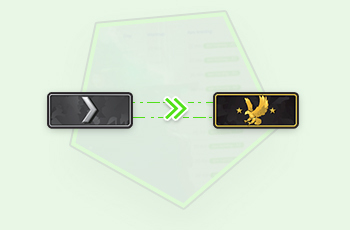 Warmup part serves as a preparation for specific CS:GO training. It takes place on the Fast Aim/ Reflex Training map. During warm-up, don’t use a primary weapon (AK47 or M4). As these 10 minutes need to “prepare” your hand and mind, it would be nice to extract more from it by choosing a custom weapon. Warm up with a gun which you are using less often (e.g. Galil, Famas or SMG/UMP). 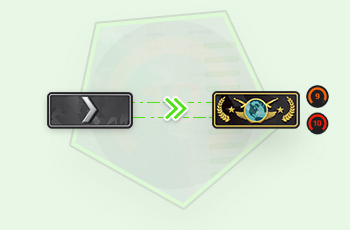 Aim training part was made to improve your overall aim and ameliorate your response time at CS:GO. It takes place on the training_aim_csgo2 map. Do this part with AK47 and M4. As you can see in the training schedule, there is no aim and burst training at one day (it is seperated). It means that you train aim and burst alternately – aim training on one day and burst training on another day. We found that this is the way to get the best results. Recoil training part is another important practice which will make you better in spraying from the most common weapons. It takes place on Recoil Master map and help you with recoil-control for AK47, M4, Famas and Galil. Deathmatch training part is a versatile training that serves as a summary of the day. It will help you to improve your overall movement and reflex in the game. It takes place on deathmatch servers. Get a complete training routine to instantly improve. 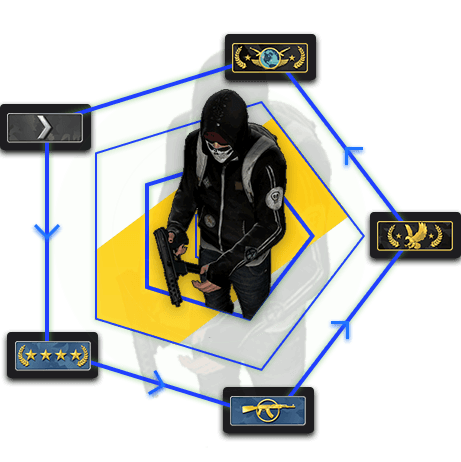 Covering all aspects of CS:GO - from the basics to advanced training techniques. Learn how to train and start playing like a pro. We provide an all-in-one training program for CS:GO. Don't waste time thanks to short and simple video clips. We explain each part of the training in an easy way. Get support 7 days a week. We facilitate the whole training process by providing assistance from coaches. Premium training allows you to achieve immediate results. You'll improve your skills faster than ever and you'll feel the difference with each passing day. * Results not guaranteed. 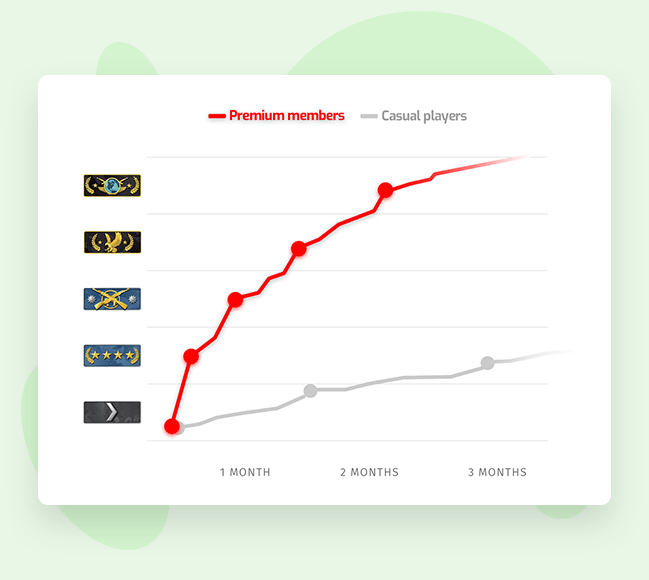 Estimated skill level, based on current premium members. Our training is divided into 4 parts. Each of them is tailored to different skill level. Regardless of your current rank, in a few weeks you'll be playing like a semi-pro. Trusted by over 120,000 players around the world! We are changing the CS:GO community since 4 years. In the right way.